Rodial 5 Minute Facial - A sachet of this clay mask featured in my last Project Sample Use Up post and my thoughts are still the same. It works really well at unclogging pores and reducing blackheads so I'll definitely be buying the full size at some point. Phyto Phytokeratine Repairing Shampoo - I liked this shampoo but there was only one use in the sachet so not enough product to see how it actually works. One good thing though is that it didn't irritate my sensitive scalp! It also felt very moisturising which I don't often find with shampoos. I might buy the full size at some point to see if it can make a difference to how my hair feels as it does get very dry. Doctor Duve Hand Cream - This was an ok hand cream, it smelt nice but did take a while to sink in so I wouldn't buy the full size. Dr Bronners Magic Citrus Orange Soap - I enjoyed using this little sample of the all in one soap and the pleasant orange scent. I will be buying a full size of the unscented one but not for a shower gel, it's a bit too watery for my liking, instead I'm going to be using it as a brush cleanser which I've heard works really well. I just need to finish Johnsons Baby Shampoo which is what I'm currently using for my brushes. Liz Earle Sheer Skin Tint - I already own the full size of this which I loved when I first tried it but now for some reason it seems to oxidise very badly on my skin after an hour or so. Although I like the finish and the coverage, I wont be buying another tube once I finish the full size. Origins Plantscription Anti-Aging Serum x2 - This was an ok serum, it felt really nice on my skin and was hydrating but I'm not looking for an anti-aging serum at the moment. I am planning on buying a different Origins serum though. Origins Hight Potency Night-A-Mins x2 - I really loved the orange scent of this night cream and how thick and moisturising it was. I woke up the next morning and could still feel it on my skin. I'm going to be buying the full size in Autumn or Winter. 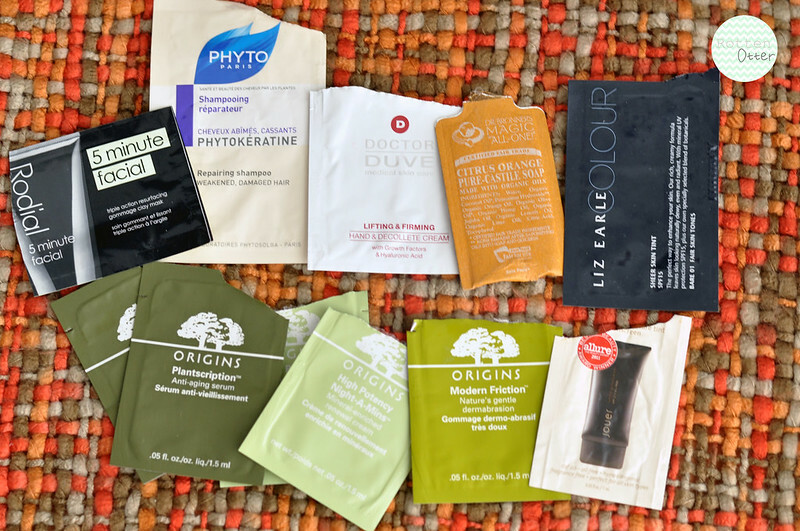 Origins Modern Friction - I was very surprised at how little product was in this sachet as usually with Origins sachets they're full and I can at least two uses out of them. I only managed to apply this to my nose so couldn't really test it out properly. I probably wont be buying the full size of this scrub but I might ask for a better sample at a counter. Jouer Luminizing Moisture Tint - If there's one time I hate having very pale skin, it's using foundations. There's so many that I want to try but the shades are just way too dark for me and very orange toned. This one from Jouer is no exception and I'm glad I only have a tiny sample sachet. Sadly I wont be buying the full size of this one. I'm doing something similar! It's amazing how quickly samples can add up, isn't it? I love Origin's Night-a-Mins :) great job with the samples! Thanks for these mini reviews! I also have a few samples that need to be used up! I have the opposite problem with foundation samples they are always too light for me! I love getting samples, I really helps to try out expensive products before buying them. I had a few samples of the Liz Earl Sheer Skin Tint and used the last up not so long ago, I really liked the coverage and how it wore throughout the day. I would buy the full size. I need to take a leaf out of your book and start using up more of my samples.